Alternatively referred to as Twin Peaks: The Return when it broadcast on Showtime in the U.S., Twin Peaks: A Limited Event Series on Blu-ray Disc is the culmination of over four years of development between series creators David Lynch and Mark Frost to reassemble the cast, some of whom passed away during and after the production, and continue the story in show time 25 years later and layer within it more esoteric symbolism and multiple meanings that could be discussed for years to come. Without revealing any spoilers, the series ending, which has certain hints of what is to come that are easier to spot upon multiple viewings, is probably one of the most divisive conclusions to broadcast and stream on a premium pay cable network since David Chase’s finale to The Sopranos. While David Lynch proves himself to be an American Master Filmmaker of the highest order in what is essentially an 18-hour feature film spread across the summer of 2017, Lynch and Frost greatly expand the Twin Peaks Universe to include locations set in New York, the Midwest, Las Vegas and even other dimensions of existence where the supernatural influences the seemingly unrelated synchronistic events that culminate in an explosive confrontation between malevolent forces and benevolent forces moving characters into place almost like a cryptic chess game. Star Kyle MacLachlan carries a huge weight with an all star ensemble cast as he portrays no less than three distinct characters that has earned him a well deserved Best Actor Golden Globe nomination and I hope everyone involved with the making of this series will get accolades of some sort of recognition that will boost their respective careers regardless of who they are and what they did. Even as a kind of publicity spokesperson for the show while David Lynch was abroad during the series first premiere airing on Showtime, Mr. MacLachlan represented Twin Peaks in a first rate way, whether it was appearing on television talk shows on both sides of the Atlantic, interacting with fans on Facebook, and attending SDCC 2017, I don’t think anyone outside of Lynch himself could pull off the publicity in such a genuine matter. For twenty five years, the good FBI Special Agent Dale Cooper (MacLachlan) has been trapped within the Black Lodge while his doppelganger infused with the demonic spirit known as Bob, has concocted a plan to stay in our reality as he searches for the coordinates to what perhaps could be described as the mother of all evil with the aid of shadowy entities that appear as Dark Woodsmen who serve their master on Earth and beyond. The Black Lodge is a sort of combination of purgatory or the underworld and perhaps even Hell itself. Beyond the veil of time as we understand it, Cooper’s chance at restoring balance and returning to our world are put at risk during an attempt to sabotage his return that results in him coming back in the guise of Insurance Claims Inspector Douggie (MacLachlan), a kind of savant like presence whose actions bring together various old and new characters as well as many Actors that have worked with Lynch before in strange and at times wonderful rendezvous. The Blu-ray Disc Box Set contains eight discs within a cardboard gatefold with the red curtains and strange floor pattern of the Black Lodge on it as well as disc content details printed upon it too. The outer case is a tableau of the three characters MacLachlan inhabits within the series. All of the episodes as well as extra value content are presented in 16 by 9 1080p full HD resolution while all of the episodes include English Dolby TrueHD 5.1 Surround Sound that captures Lynch’s signature sound design to great atmospheric effect. English Subtitles for the Deaf and Hearing Impaired are also encoded onto all eight discs. Extra value features include on disc one all of the Showtime promo spots (5:44) as well as the Showtime promotional featurette, Phenomenon (14:26) and the episodes on discs one and two can either be viewed in their episodic form or in the broadcast feature length presentations of episodes one and two (1:51:37) and three and four. Disc two also features the Twin Peaks SDCC Panel (1:01:33) complete with David Lynch’s video introduction presented to attendees and later released on YouTube. Disc seven contains a complete crew list for everyone involved in the making of this series (4:02) as well as a behind the scenes documentary by Charles de Lauzirika (27:10) and two behind-the-scenes films by series Actor Richard Beymer (29:23 collectively). All of the Rancho Rosa Logos (2:22) and a photo gallery wrap up the features on the seventh disc. Finally disc eight contains the multipart feature length behind-the-scenes documentary Impressions: A Journey Behind The Scenes Of Twin Peaks (4:51:07), which sounds as though it was narrated by Werner Herzog even though it is not to my knowledge after checking IMDB while reviewing the extra value materials in this Blu-ray set. Each disc’s interactive menus features various locals from the series in the background at times with jarring sound waves that include the swishing red curtains of the Black Lodge, the floor pattern of the Black Lodge, the waterfalls, the forest, the moon, another forest backdrop and the R&R Café. This is truly one of the most comprehensive TV sets I have ever reviewed for a television series on Blu-ray Disc and a must have companion to the 2014 Blu-ray Disc set, Twin Peaks: The Complete Mystery. 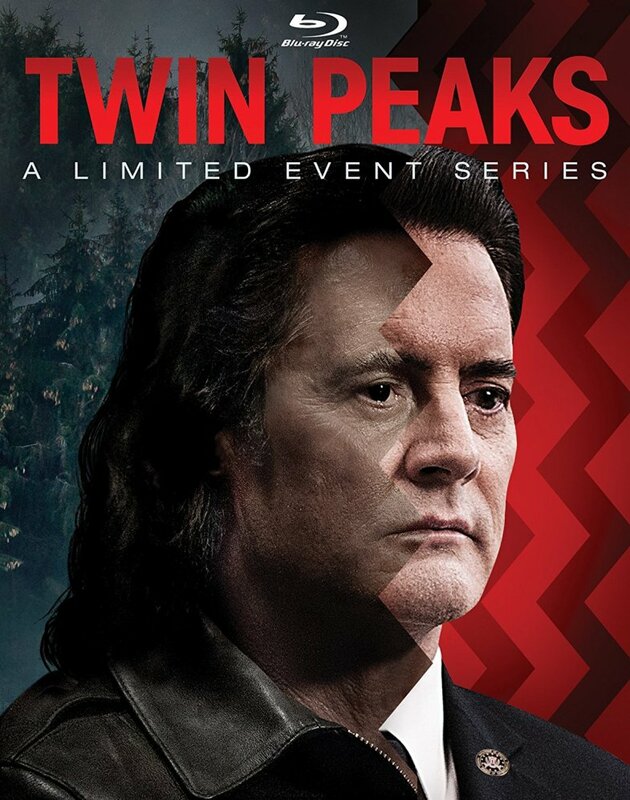 Twin Peaks: A Limited Event Series is available now on Blu-ray Disc at retailers on and offline courtesy of CBS Blu-ray Disc and Paramount Home Entertainment.